Aquatic resources are fundamental to local livelihoods in Attapeu and are a key component in the well being of local people. Their livelihood strategies involve the use of multiple resources. The study areas in Attapeu are characterized by a wide range of aquatic environments. These include permanent and seasonal, flowing and standing, natural and man-made water bodies. Each type of waterbody has its own annual hydrological cycle, is characterized by its own community of aquatic organisms and is subjected to a particular pattern of resource use by local people. The main categories of aquatic environment identified during this study include rivers and perennial streams, perennial ponds, marshes, oxbows and rice fields, seasonal ponds and seasonal streams. 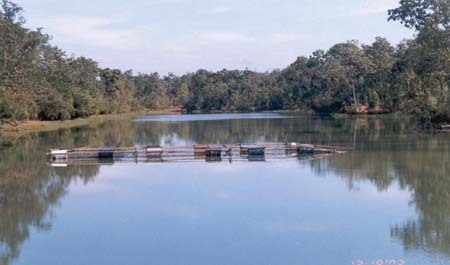 Rivers and perennial streams are key features in the lowlands of Attapeu and important sources of fish and other aquatic produce. They sustain a range of aquatic organisms throughout the year. They are also subject to large annual fluctuations in volume and flow between the rainy and dry seasons. Because these are permanent water bodies, they serve as dry season refuges to a broad range of fishes and aquatic animals and are critical habitats for a number of strictly riverine species. Fishing in rivers requires a certain level of specialization. The changing nature of the environment caused by the fluctuations in water flow and the seasonal activities of fish, some of which are migratory, requires specific knowledge and equipment. Boats, specialized nets and other gear are needed to fish successfully in rivers and large streams. Much of the simpler, cheaper and more common household gear has limited application in the river. This means that successfully accessing riverine aquatic resources requires financial investments in gear and a certain amount of skilled labour (typically strong males). Households that lack the labour to use the specialized gear or the means to purchase boats and equipment are limited to resources along the edges of the rivers using smaller gear during periods of low water and assisting others during peak fishing periods. Those who can fish in the river are subject to seasonal scarcity, but are able to catch some fish throughout the year. Perennial ponds, marshes and oxbows are fairly common in the lowland-floodplains of Attapeu. They serve an important function by receiving excess water during the rainy season and holding it throughout the dry season. These water bodies are usually shallow and vary greatly in size over the course of the year, expanding during the rainy season and receding during the dry season. In many cases, they function like an aquatic lung, receiving water directly from a rising river or stream during the rainy season, and then draining it back into the river or stream as the water level drops in the river or stream. These water bodies serve as refuges for fish and other aquatic organisms during the dry season and are the source of many flood plain fishes during the rainy season. The key species are mainly floodplain fishes but some riverine fishes are trapped when the water recedes following periods of flooding. Because the water is relatively fertile and shallow in areas, many types of aquatic plants, molluscs, crustaceans, amphibians and reptiles are abundant. Fishing in perennial water bodies such as ponds, marshes and oxbows is less specialized than river fishing and requires less investment. Because these water bodies are typically shallow (or have shallow areas), aquatic plants and animals are easy to access with simple, small gear or by hand-collecting. These areas are often of special importance to poor people. When the water recedes and seasonal water bodies have dried or been harvested, people fish in permanent water bodies with other types of gear, including small-scale, household gear. Diversity is a key strategy for coping with the seasonal nature of rice production and other crops and varying availability of water resources. Rice fields are an important and often overlooked source of aquatic resources. Rice fields and constructed seasonal ponds extend the productive phase of the aquatic environment. Seasonal rains inundate wide areas of lowland, typically from June through to October. Fish from perennial water bodies migrate out to seek food and reproduce in these newly created water bodies. Migration out to rice fields (and return migration at the end of the rainy season) takes place through seasonal streams that drain into the rivers. Rice fields and seasonal ponds play a similar role in local hydrology in that they hold water higher in the watershed for longer periods than would otherwise be possible. Several species of fish and aquatic animals have evolved to take advantage of these temporary aquatic environments. At the begining of the rainy season they quickly disperse and reproduce (or in some cases reproduce and disperse) to fill the empty ecological niches that quickly appear in newly inundated areas. 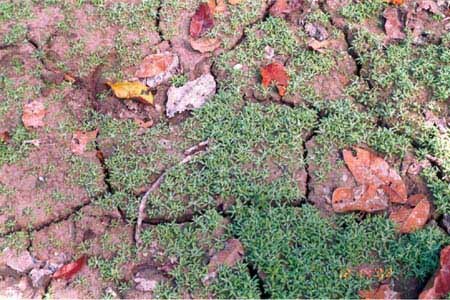 Almost as soon as the rains begin, rice fields are populated with organisms that have been dormant or relatively inactive in permanent water bodies during the dry part of the year. Much of the household fishing activity is focused on rice fields from the beginning of the rainy season (June) until they dry up (in early to mid-November to January). Harvesting is done with simple, inexpensive gear and requires few specialized skills, which makes it easily accessible to poor people. Fishing effort focuses on migration pathways to and from water bodies, and can be especially productive at the end of the aquatic cycle when fish are moving out of the flood plain back to permanent water bodies. When assessing aquatic resources and their availability, the initial impression is that fishing activities take place throughout the year. This is, however, an over-simplification of a quite complicated series of activities. Over the course of the year, fishing effort is focused on different water bodies using different techniques and targeting different fish species. Such issues are complex and interrelated, but can provide a useful framework to better understand resource use. A general description of how these factors affect aquatic resource access patterns is provided in Table 4. Tamoyot is a village with an extensive pattern of resource use. The village is located in a lowland area that has a number of water bodies and a range of wetland habitats. Much of the surrounding area consists of rocky, laterite soils where topsoil is extremely shallow or nonexistent. This type of land is not suitable for agriculture and is covered with scrub forests that flood on a seasonal basis. The relatively low population pressure in the area allows local people to access different types of water bodies throughout the year. One of the main constraints to harvesting aquatic resources is the inhospitable nature of the forest during certain times of the year (i.e. a large number of leaches during the rainy season), and the level of effort that people are willing to expend. · Ethnically Su. They moved to the present location 20 years ago because of water availability. They practice rotational upland rice cultivations. · Villagers are lowland Lao. They have a centurys long history of rice cultivation and fishing in the Se Kamon River valley. · Ethnically Oi. The villagers have practiced paddy rice cultivation in intricately laid out, terraced rice fields at the foot of the mountain for generations. Have recently moved to current location near the river. · The nature and scale or water bodies accessible to Tamoyot are conducive to a general approach to aquatic resources access and use. · Saisi villages main water body (the Se Kamon River) requires specialized skills and equipment for fishing. · With a range of water body types available, villagers have a choice of how and where effort is spent. · All water bodies seem to remain relatively productive based on seasonal cycles. · Production of lesser water bodies does not approach the production of the river. · The rice field fishery is becoming less productive, the river and the oxbow lake are becoming more important. · Somewhat remote, road to village not passable for much of the year. One half to a full-days journey to district town. Much commerce is done through barter with other villages rather than the market (i.e. trading fish or wildlife for rice). · Both district and main provincial markets are easily accessible. The main provincial market can be reached by road or boat in less than an hour. · The main provincial market is within ten kilometres of the village. It can be accessed on a daily basis (about 30 minutes by bicycle). The village is located on the main road to Sekong and Pakse. · Food security is a major issue. Many households only produce enough rice to last 4-5 months. Aquatic resources and various forest products are used for barter to secure food the remainder of the year. · The majority of the villages produce enough to last the whole year. Vegetables are grown for sale and aquatic resources are harvested for consumption and sale. · Most households produce enough rice for consumption. Seasonal shortages of other foods mean that villagers depend heavily on aquatic resources and forest products at certain times of the year. Saisi is a village with a long, historical relationship with the Se Kamon River. Most households own boats and gear for fishing in the river. The productivity of the river, although seasonal and perceived to be decreasing, is still higher than that of the nearby seasonal water bodies (rice fields, seasonal ponds and a seasonal stream). These water bodies are fished as well, but most of the fishing effort focuses on the river. Gayeu village has a long tradition of rain fed rice production. The village has a large area of paddy fields that are intricately terraced and well managed. There is a local practice of digging trap ponds to harvest rice field fish, and there is a system of hereditary rights to key locations for trapping fish along seasonal migration routes to and from the rice fields. Because the rice field fishery has sharply declined, much of the fishing is done in permanent water bodies. Some families fish in the Se Kong River, but the majority fish in the nearby oxbow lake. Although the river is closer than the lake (1+ km versus 3+ km), most people prefer fishing in the lake rather than trying to specialize in river fishing (i.e. using boats, specialized nets, and specialized techniques). Lists of fish and aquatic organisms were compiled from interviews with villagers rather than sampling. Nonetheless, they provide a good indication of the aquatic biodiversity in the lowlands of Attapeu Province. As seen in the lists of aquatic species reported from each village, a wide range of organisms representing different aquatic environments are being caught and consumed or sold. In the fish lists reported from each village in Table 5, a broad range of species representing different aquatic environments is being caught. The list grows longer when we add other aquatic animals such as crustaceans, molluscs, amphibians, reptiles, insects and aquatic plants. Fish - An impressively high number of fish species were reported during each village activity, ranging from 66 species reported by Tamoyot to 102 species reported by Saisi. These species fall into two major groups: riverine species and floodplain species. Aquatic animals (non-fish) - Other aquatic animals reported include several species of crabs, shrimp, frogs, shell fish, turtles, and insects. In some cases, these animals (especially frogs, shrimp and crabs) are as important to household consumption as fish. Aquatic plants - Aquatic or semi-aquatic plants are an important part of rural diets in Attapeu. Aquatic plants include those that float or are submerged and rooted in water. These are most abundant during the rainy season when the area is inundated by flood water. Semi-aquatic plants grow in moist areas along the edges of water bodies and are most abundant during the dry season. Households that routinely suffer from food insecurity in the form of insufficient rice often depend on wild aquatic resources to compensate for this deficiency. Decreases in total fish production, in absolute terms, are difficult to determine. In this case, what is more significant is the availability of fish to individual households (Table 5). By all the measures listed above, the availability of fish and other aquatic resources at the household level is declining. Poor households are likely to be the most adversely effected because of their limited availability of labour or capital to purchase more effective gear. One of the main development priorities of the province is to increase rice production. 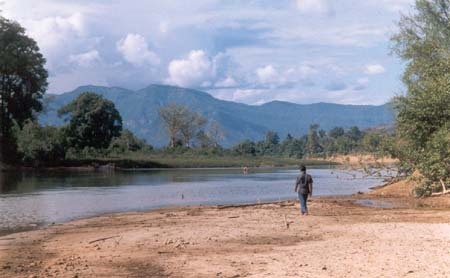 The lowlands of Attapeu make up the seventh largest area of potential agricultural land in Lao PDR and are part of the countrys overall plan for meeting food security. Although the province has increased rice production in recent years, it has realized little of its potential for agriculture production. Provincial plans to increase rice production include expansion of land area under cultivation, an increase in dry season cropping through the development of irrigation systems and promotion of improved varieties of rice. Provincial authorities are encouraging farmers to increase the area they are cropping. Land not yet being farmed is considered underused and available for development and is thus targeted for conversion into agriculturally productive land. This low lying land area includes a wide range of aquatic habitats that play an important role in supporting aquatic biodiversity. Current efforts to promote dry season rice production have met with limited success. Although there has been substantial investment in infrastructure for irrigation in some areas, farmers have been reluctant to invest in a second rice crop. As a result, much of the dry season irrigated land is not used for rice production. One of the main reasons is that farmers feel that profits are too low to assume the risk of borrowing money to produce the second crop. Local people do not see increased rice production as incompatible with productivity of other aquatic resources. Village-level discussions revealed that the use of improved varieties of paddy rice is widespread in Gayeu and Saisi villages. In Tamoyot, people practice upland rice production almost exclusively. Farmers estimated that approximately 70 percent of the rice planted last year was of improved varieties. Seed varieties are easily available, and the Provincial Agriculture Office is currently working to produce seed locally. Although farmers are using new varieties, they have changed little about their production systems. They continue to manage rice production using traditional methods. The use of fertilizer and pesticides is still minimal, but said to be increasing. Given the inadequacies of local diets and the prevalence of chronic malnutrition, the role of aquatic resources in rural livelihoods is vital. As the main animal protein source in already protein-poor diets, aquatic resources are central to maintaining peoples health and well-being. Strategies for food security and poverty alleviation in Attapeu Province should pay special attention to sustainable aquatic resources management. The current decline in productivity of aquatic animals from rice fields is not blamed on rice production practices, but on over-harvesting of fish below the rice fields in the adjoining wetland habitats. Irrigation schemes are even perceived to increase aquatic resources other than rice by maintaining an aquatic environment through the dry season. Fish, frogs and shrimp are reported to inhabit the irrigated fields if there is a permanent refuge within the irrigated area to maintain the population (rather than entering through the irrigation system). Agricultural chemicals are a threat to aquatic production, but as few chemicals are used, there is no first hand experience with their adverse effects. Local people do not see increased rice production as incompatible with productivity of other aquatic resources. However, the conversion of land providing important habitats for aquatic animals may pose serious threats to the main source of animal protein in local diets. Livelihood strategies are dependent on the use of a range of resources and a combination of different activities. Diversity is a key strategy for coping with the seasonal nature of rice production and other crops and varying availability of water resources. Both aquatic resources and rice are fundamental to nutrition and health, yet local development strategies emphasize rice production. This is being done without due consideration of the impact on the aquatic resource base and the potential development opportunities of appropriate management of wild aquatic resources. By many definitions, including Ramsar, all these water bodies are types of wetlands.